The Mumbai rain event of 26 July 2005 spawned several investigations by meteorologists, particularly modellers, to find out the reasons behind this most extreme of extreme events, and to attempt to somehow predict it even in hindsight. It is now the turn of moviemakers to take up this event and make a different kind of story out of it. 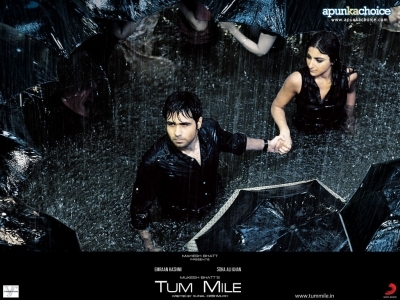 “Tum Mile” is a new Hindi movie based upon the Mumbai rain event of 26 July 2005. It was to be released on its fourth anniversary but the release got postponed to 13 November 2009. As chance would have it, while I am writing this blog on 11 November, Mumbai is under the threat of a cyclone and is already experiencing heavy rains! So the postponed movie release is also well-timed! “Tum Mile”, directed by Kunal Deshmukh, stars Emraan Hashmi and Soha Ali Khan in lead roles. The story is about two ex-lovers who meet again after a gap of six years. They happen to be on the same flight back to Mumbai, and get there only to see the city going through its worst times, with the highest rainfall in history, and they are forced to stick together in this time of crisis. As the metropolis copes with its nightmare, they also struggle with their own situation, and come to terms with their own lives.